Sugar can be very tempting indeed, but if you are trying to lose weight and are still taking in sugar in large amounts then it will not be of any help. 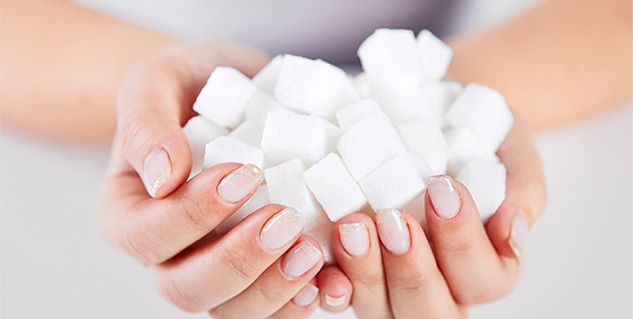 Know how to reduce your daily sugar intake. Sugar is a complete no-no when you are on a weight loss program. But, isn’t sugar necessary for normal functioning of your body? Yes, it is. This indicates that while you cannot completely cut your sugar intake in order to lose weight but you can always reduce the amount of intake. Here are the ways by which you can reduce the amount of sugar in your food and reap its benefits. • The foremost step to cut down your consumption of sugary foods is to educate yourself about the food items containing high-sugar content. The foods loaded with sugar include all desserts, candies, chocolates, cookies, cake and pastries. Limit the intake of such foods, they may satisfy your taste buds, but also add bulges to your body. Always read the labels of the packaged foods to know how many grams of sugar they contain. • Juices, sodas, cocktails and mock tails are also high on sugar. They contain high fructose corn syrup, which is a bigger health concern than normal sugar. • Fruits such as mango and sapodilla (chikkoo) are naturally high on sugar. Thus, take one cup of such fruits in your snacks. This will help you to lower your blood sugar level as well as satisfy your sweet tooth. • After identifying the high sugar foods, you need to check your kitchen for those. Go through all the kitchen contents and take out all foods high in sugar such as cookies, donuts or chocolates. Search your fridge for sugary beverages. Stack all the sugary items on a shelf, which are out of sight or reach. • If you want to keep candies in the kitchen for your kids, hide them in a cupboard and lock it. Make a resolution that you will open that cupboard only when your kid asks for a candy. • Replace your sugar container with an artificial sweetener. For this you may need to shell out extra money, but it is worth for reducing health risks such as increased risk of diabetes and weight gain. It is a proven fact that sugar is a mood altering substance. In times of turmoil, when you are stressful and out of energy, your craving for sugary foods shoots up. Thus, always keep your spirits and mood high to avoid consuming foods high on sugar. Practice yoga, self-talk and meditation to keep your mood uplifted. • Protein helps to regulate your insulin level as it takes much more time to get digested than sugar. • Protein makes you feel full early and increases your energy-producing rate (metabolism). Thus, it burns calories faster and gives you lean and fit body. • Add protein sources in all your meals and snacks. Some excellent sources of protein, which you can add in your meals are lean beef, pork, chicken, turkey, fish and seafood. • As snacks, you can take a handful of nuts and dairy products. However, keep in mind that many of these are high on fats. So, eat them in moderation. A sugary treat is fine, but only a few times, regular intake can really have an effect on your weight. Who Says Lazy Men cannot Have a Flat Stomach?